For other uses of this term, see Isabella of Portugal (disambiguation). Isabella of Portugal (24 October 1503 – 1 May 1539) was Holy Roman Empress and Queen of Spain, Germany, Italy, Naples and Sicily and Duchess of Burgundy by her marriage to Emperor Charles V, and regent of Spain during the absences of her husband during 1529-1532, 1535-1536 and 1538-1539. Isabella was the granddaughter of the Catholic Monarchs, Isabella I of Castile and Ferdinand II of Aragon. Throughout her life, many compared her to her grandmother for her character and her determination in politics. 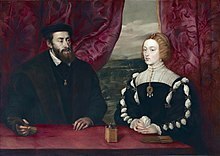 A woman of great beauty and intelligence, Isabella was undoubtedly the Spanish soul of Charles V who, because of his travels in Europe, spent little time in Spain due to political affairs abroad. It was thanks to the governorships of Empress Isabella that Spain was able to remain independent of imperial policies. 7 "The Empress of the Carnation"
Isabella was the second child and eldest daughter of King Manuel I of Portugal and his second wife Maria of Aragon. She was named after her maternal grandmother and her aunt Isabella, who had been her father's first wife. Isabella was second-in-line to the throne until the birth of her brother Luis in 1506. However, as the oldest daughter of Manuel I of Portugal, she was a rather attractive candidate for marriage. Isabella spent a happy childhood in the company of her parents and siblings. She was educated under the supervision of her governess Elvira de Mendoza. She would progressively become a beautiful and intelligent young woman, learning the languages of Latin, Spanish and French, the Christian doctrine and the Renaissance classics. In addition to all this, she was very wealthy, possessing a vast and complete library, composed of works of a spiritual nature, destined for prayer and personal enrichment, as well as more mundane works which were of the Infanta's taste, especially on cavalry. Isabella's mother left in her will, and in a clear message to her husband Manuel, the desire that Isabella should marry only a king or the legitimate son of kings. The ideal candidate for Isabella's husband was her first cousin Charles, the son of Maria's sister Joanna of Castile and Philip the Handsome. A marriage between Charles and Isabella brought a strong alliance between the kingdoms of Spain and Portugal, in accordance with the wishes of their grandparents Isabella and Ferdinand. An alliance between Portugal and Spain was essential in order to continue the exploration of the oceans without incurring clashes with Castile. It is evident that Castile needed Portugal as an ally. In the constant evolution of Europe, now that Charles was sovereign of multiple kingdoms, especially after his election as Holy Roman Emperor, Castile needed allies. It was necessary that Portugal fall under the orbit of Castile and not of France, which had happened in the War of Castilian Succession. To have Portugal as an ally of Castile meant having their backs covered in the Peninsula and overseas, as Portugal was the only naval power that could question the supremacy of Castile in the Atlantic. It was, moreover, the richest kingdom in the Christendom. Portuguese consent had allowed Castile to cement its position in the Canaries and on territories of the Kingdom of Fez (Melilla and Cazaza) and their support was necessary to fight the infidel in Barbary. In conclusion, the alliance with Portugal was a guarantee of peace and stability. However, Charles's Flemish advisors, especially William de Croÿ, convinced him to relegate the Portuguese alliance to the background and replace it with an alliance with England. In 1521, Charles became engaged to his other first cousin Mary Tudor, daughter of Henry VIII of England and Catherine of Aragon, who was sixteen years younger than Charles and still a child. The engagement between Charles and Mary sought to undo an alliance between England and France, articulated by the ambitious Cardinal Thomas Wolsey. Many in Portugal took the rejection of Isabella as an offence, but Isabella remained determined and hopeful that she would marry Charles. The choice was that she would marry only Charles or she would enter a convent. By 1525, Charles was no longer interested in an alliance with England and could wait no longer for Mary Tudor to get older, as he was determined to have legitimate children. The engagement to Mary Tudor was called off, the alliance with England was abandoned and Charles finally sought to marry Isabella. There were many more advantages in his marrying Isabella - she was closer to Charles in age (she was only three years his junior), she was fluent in Spanish and she offered a handsome dowry of 900,000 Portuguese cruzados or Castilian folds, which was more than enough to solve many of Charles's economic and financial problems brought on by the Italian War of 1521-26. The negotiations and marriage contract for an alliance with Portugal were made - Isabella would marry Charles and her brother King John III of Portugal would marry Charles's youngest sister Catherine of Austria. In January 1526, Isabella travelled to Spain. Upon her arrival, she was met at the Spanish-Portuguese border by the Duke of Calabria, the Archbishop of Toledo and the Duke of Béjar, who escorted her to Seville, where she was to wait for the Emperor. Isabella arrived in Seville in early March and just a week later, Charles arrived. Although their union was originally a purely political arrangement, Charles fell deeply in love with the beautiful Isabella and their wedding took place that very same day just after midnight on 11 March in the Palace of Alcázar of Seville. Despite the Emperor's absences from Spain, the marriage proved to be a happy one as both partners were always devoted and faithful to one another. Following their wedding, the couple spent a long and happy honeymoon at the Alhambra in Granada and records show that during their honeymoon "when [Charles and Isabella] are together, although there are many people around, they do not notice anyone else; they talk and laugh, and nothing else distracts them." Isabella proved to be a more than competent politician when she served as regent of Spain during her husband's absences between 1529–1532 and 1535–1539. As Empress, Isabella was not brought up just to be a mother and a wife. Inheriting the blood of her maternal grandmother, she was a determined woman, honouring the education given to her in this direction by her mother and father. All the documentation of the time indicates that Isabella was a profound connoisseur of the problems of the peninsular kingdoms, defending intransigently the royal power, the supreme authority of the monarch and the good common to particular interests. At the external level, her sensible actions were decisive in the defence of the coasts of the peninsula and of North Africa, those invested by piracy. During her time as regent, the Empress traveled a lot around Spain. Due to the very hot weather of Toledo and Seville, she spent the summers in the milder Avila because she suffered several times from malaria. She traveled regularly in the autumn between Toledo, Valladolid, Seville, Barcelona and Majorca. To mitigate the longings and to deal with important matters of the empire, Charles and Isabella wrote to each other regularly. Sometimes, the emperor did not write for months, to the point of worrying the Empress, who in one letter, "scolded" him, saying that at least, she would write "every twenty days." When she heard that her husband was about to return, she sent for a reception with a large party, but during the time she was alone with her children, the ladies and counselors of the court, Isabella lived a very simple life. 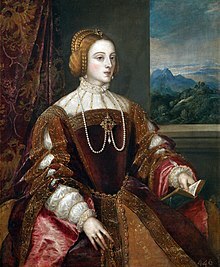 Isabella was also an excellent and devoted mother, as she raised and cared for her children and ensured their educations, especially that of her son Philip II of Spain, were providing them with great knowledge and wisdom and even taught them her native language of Portuguese. Isabella suffered from tertian fevers, which became chronic later in her life and she also suffered several times from malaria, causing her health to be very fragile. She had a total of seven pregnancies, out of which five were successful, two of her children dying in infancy; she also suffered two miscarriages. The absences of her husband caused her great loneliness, which some historians believe further weakened her delicate health. In 1539, Isabella became pregnant for the seventh time, but in the third month of her pregnancy, she contracted another fever, which caused antenatal complications and resulted in the Empress giving birth to a stillborn son. She died two weeks later on 1 May 1539 at the age of 35. The Emperor was left so devastated by his wife's death that he could not bring himself to accompany her body to her original burial place in Granada. Instead, he instructed their son Philip to accompany his mother's body with the nobleman Francis Borgia, while Charles locked himself up in a monastery for two months, where he prayed and mourned for his wife alone. 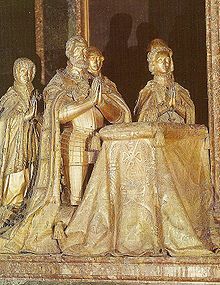 Borgia conveyed Isabella's remains to the Royal Chapel of Granada, the burial place of the Catholic Monarchs, and when he saw the effect of death of the beautiful empress, he decided to "never again serve a mortal master". After the death of his own wife in 1541, Borgia retired from court and became a Jesuit priest. In the aftermath, Charles never recovered from Isabella's death; he never remarried and he dressed in black for the rest of his life. In memory of her, he commissioned several tributes through art and music, beginning in 1540 when he commissioned the Flemish composer Thomas Crecquillon to compose new music in honour of the Empress. Crecquillon composed his Missa Mort m'a privé as a memorial to Isabella, which expresses the Emperor's grief and great wish for a heavenly reunion with his beloved wife. Another musical tribute to Isabella is Carole cur defles Isabellam that was composed in 1545 by the Franco-Flemish composer Nicolas Payen. In 1543, Charles commissioned his favourite painter Titian to paint posthumous portraits of Isabella by using earlier ones of her as his model. Titian painted several portraits of the Empress, which included his Portrait of The Empress Isabel of Portugal and La Gloria. He also painted a double portrait of Charles and Isabella together, of which there is a copy by Rubens. Charles kept these portraits with him whenever he travelled and after he abdicated in 1555, he retired to the Monastery of Yuste. The portraits by Titian were among those he brought with him and he would spend hours everyday contemplating them, especially the portrait of Isabella. In 1574, the body of Empress Isabella was transferred by her son Philip II to the Royal Monastery of San Lorenzo de El Escorial, where she was originally interred into a small vault along with her husband directly underneath the altar of the famous Basilica of the Monastery. This was done in accordance with Charles's last will and testament, in which he left a codicil asking for the establishment of a new religious foundation in which he and Isabella would be reburied together side by side, "half-body under the altar and half under the priest's feet". They remained in this vault until 1654 when they were transferred into the Royal Pantheon of Kings by their great-grandson Philip IV, who, in doing so, disrespected his great-grandfather's wishes. 21 April 1539 Miscarried and stillborn. "The Empress of the Carnation"
Isabella was also known as the "Empress of the Carnation", a nickname she gained after her husband introduced the red carnation to Spain as a token of his love for her. While the couple were honeymooning in Granada, Charles ordered the seeds of a Persian flower, that had never been seen before in Spain, to be planted in the gardens of the Alhambra. The seeds eventually grew into the red carnation and the Empress was so delighted by the new flower that Charles ordered thousands more to be planted in her honour. The red carnation later became the floral emblem of Spain. Isabella of Portugal is portrayed by Blanca Suárez in the TVE series Carlos, Rey Emperador. ^ Tracy, James D. (2002). Emperor Charles V, Impresario of War : campaign strategy, international finance, and domestic politics. Cambridge Univ. Press. p. 114. ISBN 9780521814317. ^ MacQuarrie, Kim (2007). The Last Days of the Incas. Simon and Schuster. p. 35. ISBN 1416539352. ^ Ford, Richard (2011). A Hand-Book for Travellers in Spain, and Readers at Home: Describing the Country and Cities, the Natives and Their Manners. Cambridge University Press. p. 258. ISBN 1108037534. ^ Ham, Martin (2006). "Thomas Crecquillon: Missa 'Mort m'a privé', motets and chansons". The Brabant Ensemble. Retrieved 23 October 2018. ^ "The Glory. 1551 – 1554. Oil on canvas". 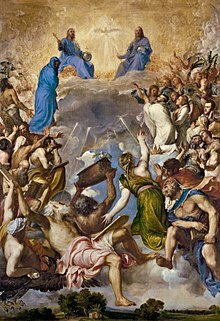 Museo del Prado (Prado Museum). Retrieved 23 October 2018. ^ "The Empress Isabel of Portugal". Museo del Prado (Prado Museum). Retrieved 23 October 2018. ^ Cuadra Blanco, Juan Rafael de la (1997). "La idea original de los enterramientos reales en El Escorial" (PDF). ACADEMIA. Boletín de la Real Academia de Bellas Artes de San Fernando (in Spanish). Madrid (85 (Separata)): 375—75 and 385—86. Retrieved 23 October 2018.